Even if you’re not a fan of Broadway musicals, there’s a decent chance you’ve heard of Hamilton, the hip-hop musical that has changed what it means to be a musical. The show has become a global, pop culture phenomenon, and in 2016, one year after its premiere, creator Lin-Manuel Miranda partnered with the legendary Roots to produce The Hamilton Mixtape. This mixtape contains remixes and re-recordings of the songs from the musical from today's biggest and best pop, rap, and R&B artists. The song “Immigrants (We Get The Job Done)” is a rap song by K'naan, Residente, Riz MC, and Snow Tha Product, and a music video for it was just released on June 28th, 2017. No shoe is better made to chase the American Dream. The song is a remix of the song “Yorktown (The World Turned Upside Down)” from Act I of Hamilton, and is based off on of the opening lines from the song. Before the Battle of Yorktown, Hamilton and Marquis de Lafayette are patting each other on the back due to the fact that they’ve both risen to high ranks in George Washington’s Continental Army. They’ve made it here because, as they put it, “Immigrants, (we) get the job done”. K’naan, Residente, Riz MC, & Snow have taken that sentiment and made it into a hip-hop anthem that covers how in a country founded by immigrants, the word immigrant has become a term of degradation. Everyone on the track kills it, with Riz MC (better known as actor Riz Ahmed) bringing extreme passion and ferocity to his verse. Residente raps in Spanish, which helps hammer home the message of being inclusive of all Americans, even if they’re not speaking English. 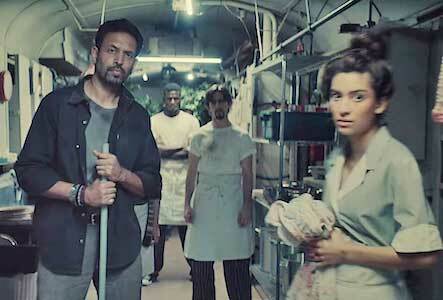 The video takes the message of the song, and puts it into beautiful visuals that show how much we may take the work that immigrants do for granted. We start out in the belly of a train car that is presumably crossing into the U.S. from Mexico, and it’s here that K’naan spits his verse. As Snow does her verse, we see an army of immigrants manufacturing American flags, which is an insanely powerful image. We also see the various careers immigrants partake in just to chase the American Dream. These jobs include farmhands, butchers, dishwashers, maids, and doctors. Many of these immigrants are wearing chucks because there is no shoe more American than the Chuck Taylor. We move into a crowded, diverse subway car where Riz MC raps from, and this image is paired with Residente riding on top of a train car. 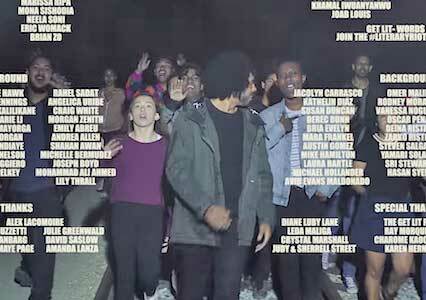 The video ends with Daveed Diggs, who originated the role of Marquis de Lafayette in Hamilton, leading a group of immigrants down the train tracks. This music video is amazing, and full of powerful imagery that is relatable to anyone who comes from a family of immigrants. This is the anthem of the American Dream from an American musical. Daveed Diggs, who plays Marquis de Lafayette in Hamilton, leads a group of immigrants across the tracks. Get yourself a new pair of chucks to pursue the American dream in by clicking on the links below.